Natacha Kiler, a marketing and communications expert with extensive experience in the solar industry, maps out why community solar will help utilities achieve clean, affordable energy. Community solar is the easiest way for people to get low-priced and clean electricity. It represents huge growth potential for all sorts of solar companies. And it can be the difference between a utility losing or retaining its customers. This entry was posted in Community-Scale Solar, NewsBlog, Research and tagged Clean Energy Collective, community solar, Nebraskans for Solar, Solar Electric Power Association (SEPA), Utility Dive on March 10, 2016 by Helen Deffenbacher. Editor’s note: An expanded version of this article will appear in the upcoming issue of Solar Mainstream, SEPA’s feature magazine. Look for it online in September and at Solar Power International. For most utilities, solar and low-income energy assistance programs are an uncommon pairing. Typically, bill assistance and energy efficiency programs have been considered the higher-priority and more cost-effective options. But Colorado is now upending those assumptions with groundbreaking community solar programs specifically designed for low-income customers. This entry was posted in Community-Scale Solar, NewsBlog, Solar for Lower-Income Households and tagged community solar for low-income customers, Grand Valley Power Cooperative, Grid Alternatives, low-income energy assistance programs, Nebraskans for Solar, Solar Electric Power Association (SEPA), Solar Mainstream, Utility Dive on August 21, 2015 by Helen Deffenbacher. The average community solar program has 213 participants purchasing power from a 1-megawatt system which is 71% subscribed. Utilities across the United States are taking a leading role in the spread of community solar projects aimed at expanding access to clean power for customers who, for a variety of reasons, may not want or be able to install solar panels on their roofs. 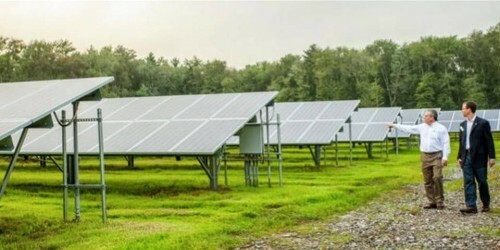 In the past 18 months alone, the number of community solar projects in the U.S. jumped 64 percent, according to figures from the Solar Electric Power Association (SEPA), which has been tracking the growth of these projects since 2012. Community solar programs initiated by utilities constitute 87 percent of the projects now online. This entry was posted in Community-Scale Solar and tagged community solar programs in the U.S., Nebraskans for Solar, Solar Electric Power Association (SEPA) on September 28, 2014 by Helen Deffenbacher.